August is HOT! I’ve always loved the heat and anxiously awaited the two months of summer that we get in Washington, but everything is different when I’m pregnant. I now get dizzy if the temperature is over 85 degrees, and have taken to wearing ice packs when I drive. (You do what you have to when you don’t have air conditioning in your car!) On days when the temperature is in the mid to high 90s, I can’t stand the thought of eating something hot. That’s when a good chicken salad recipe comes in so handy. When I know a week is going to be especially hot, we’re talking stick your head in the freezer as soon as you get home from work hot, I’ll pick a night at the beginning of the week to cook four to six chicken breasts. I keep the flavor simple, seasoned only with salt and pepper. Then I put them in a large casserole dish with a lid and cook them in the oven at 350 degrees, using a meat thermometer to make sure I remove them as soon as they reach an internal temperature of 165 degrees. By using the lid, I’m steaming the chicken breasts and keeping them nice and juicy instead of turning them into pieces of cardboard (which often happens to boneless skinless chicken breasts without a good marinade). I’ll slice a few of the chicken breasts to use in things like Caesar salad and taco salad. 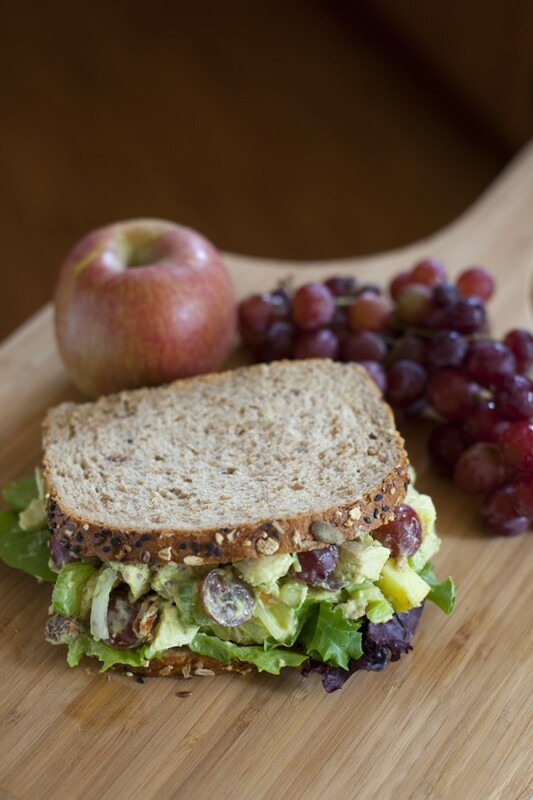 Then I’ll chop a couple of them to make this oh so flavorful chicken salad recipe. After making the recipe a few more times, I decided to sub Greek yogurt for some of the mayo to reduce the fat. I also learned that this dressing is better with an olive oil that has very light flavor. Otherwise the olive oil ends up overpowering the avocado. You can use another lighter oil, or even use avocado oil, but that will raise the cost. I only use about half the dressing on the salad, and save the rest in the fridge to either make another batch of salad or use as a dip for carrots. The nutritional info reflects using half of the dressing. Just so you can see how hot it really is, our kitten Haldir (he’s only 5 months so I call him a kitten even though he’s gotten so big!) normally likes to curl up on furniture, and especially loves to lay on anything warm, like my laptop. But the past couple of weeks, he’s taken to just plopping himself down wherever he gets hot and stretching himself out as much as possible. Last week Eric and I were working on the couch and looked over to find our poor hot kitty flat on his back airing out his armpits! Isn’t he so cute? We tend to go for salads or spring rolls when we overheat. What do you like to do for dinner when it’s too hot to cook? 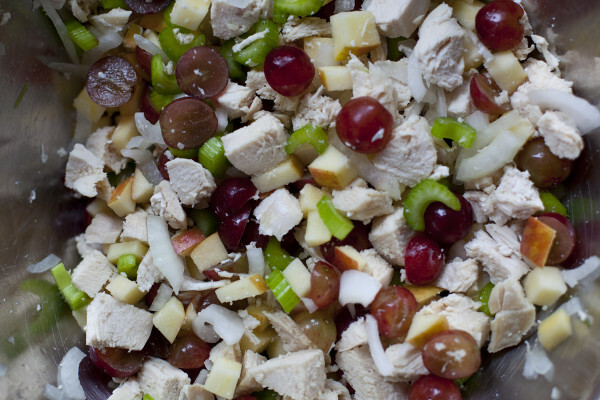 Put chicken, celery, onion, grapes, apple and pecans into a large bowl. Sprinkle with thyme and toss to mix well. 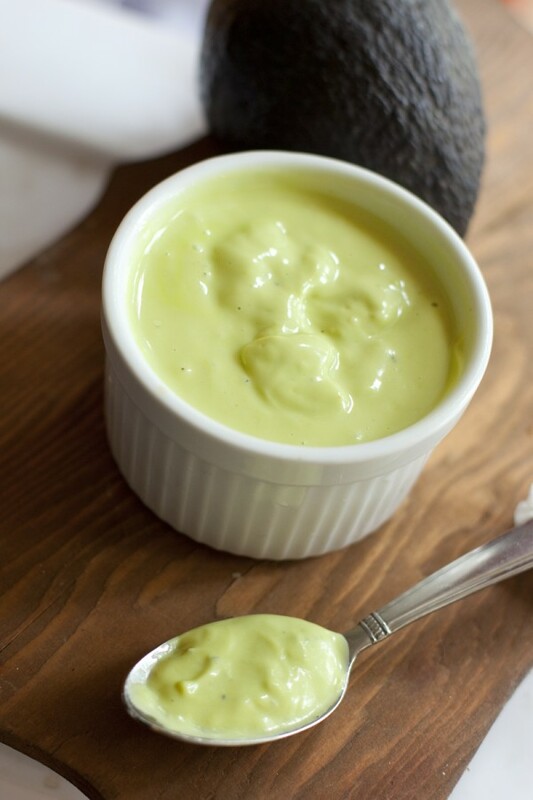 Slice the avocado in half, remove pit and use a spoon to scoop flesh into blender. Add mayonnaise, yogurt, lemon juice, olive oil, salt and pepper to blender. Blend on high until well mixed. Spoon half the dressing over salad and toss to coat. Add additional dressing if desired or store the reminder in the fridge. 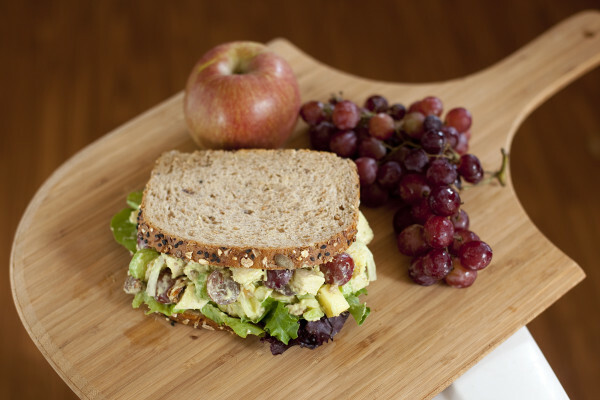 Eat with a fork, on crackers, or in a sandwich. Use within five days. 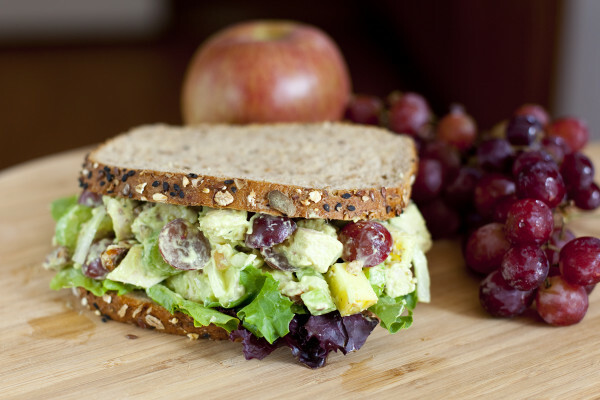 Approximate cost/serving: We usually make this when grapes are on sale, everything else is pretty cheap all year, except the avocado which we can get affordably at a hispanic grocery store or use frozen mashed avocado. This comes out to about $4.50 so around 75 cents a serving (that’s just for the salad, not including bread or crackers you eat with it). Gluten Free: The salad and dressing are gluten free. Use gluten free bread or crackers if desired. 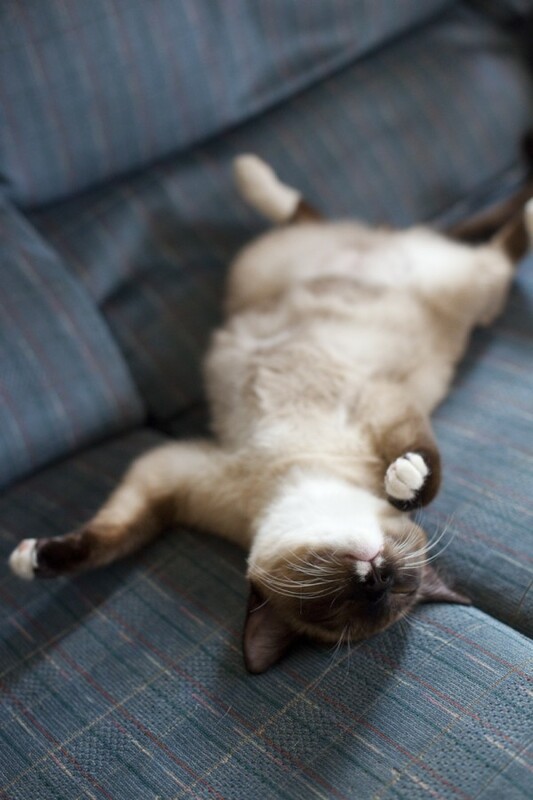 Ha ha, my cat sleeps the same way! I bookmarked this recipe. Looks nice! Thanks Victoria! Doesn’t it make you smile? 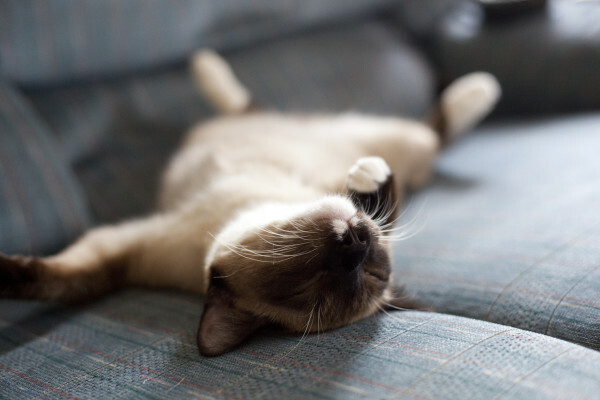 I do every time I see him sleeping like that.